The 2019 Taste of Marietta takes place Sunday, April 28, 2019, from 11 am to 7 pm. 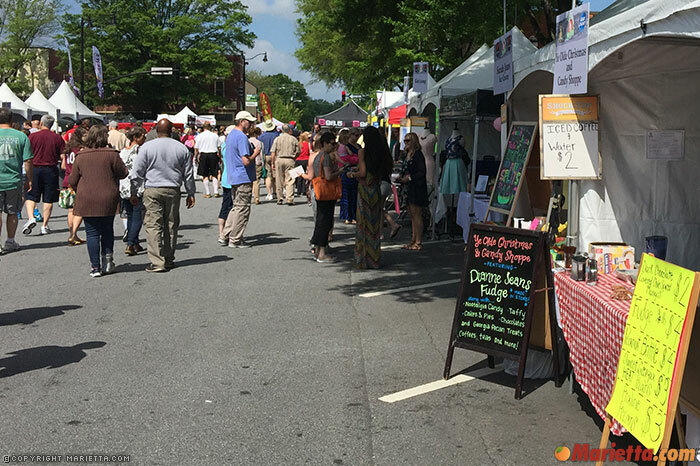 The annual event takes place in the historic Marietta Square and features over 70 restaurants and caterers showcasing their best food. Tastes range in price from just $1 to $5. In addition, there are five live music stages and a sunset concert on the Main Stage in Glover Park. 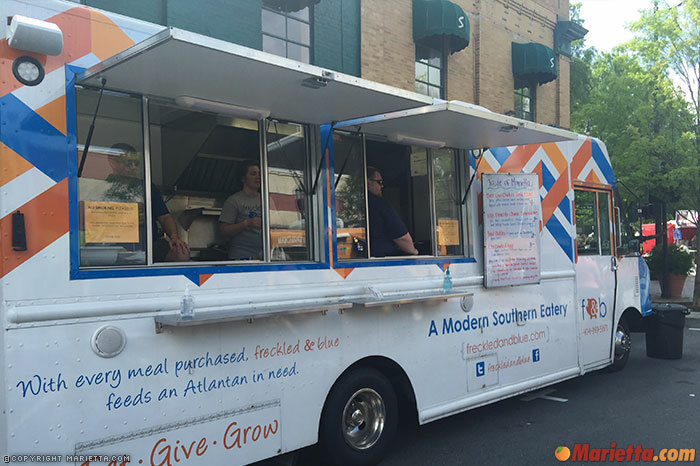 The event also features games for the kids in the Kid’s Alley, a sports corner, more than 10 food trucks, and a cooking stage with celebrity chefs’ cooking demonstrations. 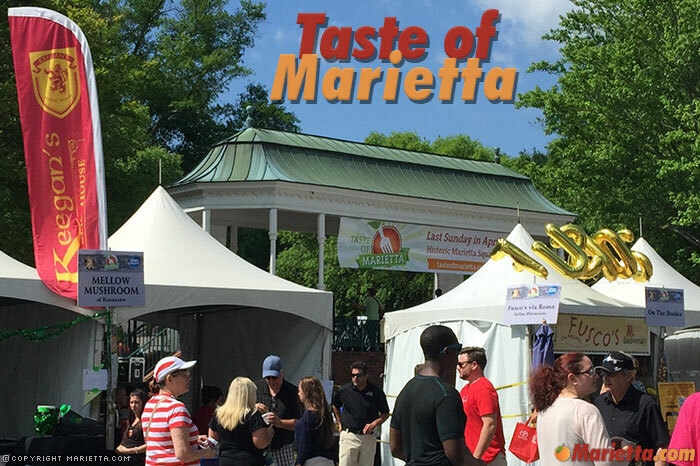 The Taste of Marietta takes place rain or shine, and admission is free. Sunday, April 28 2019 from 11 am to 7 pm. Admission to the event is free, tastes range from $1 to $5 each. Unlike other festivals, tickets are not required and it is a cash-based festival. ATM machines are available. Inflatables/moonwalks in the kids corner are also available for a fee. The Cobb County Parking Deck (enter from Waddell Street), all county court lots, and the Mill Street lot are available. The county parking deck and the Mill Street lot are free, county court lots are privately owned and parking fees may apply. 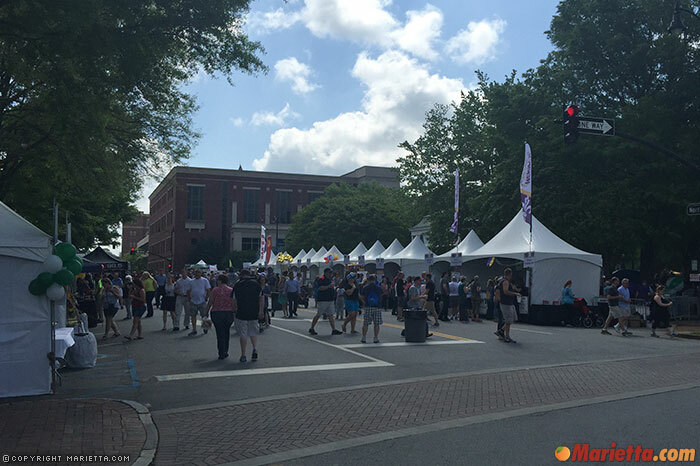 PLEASE NOTE: Parking for Taste of Marietta at Marietta Square area is not permitted at churches, including First United Methodist Church and Marietta First Baptist Church. The churches have many activities this day and their lots are for their parishioners. For more information, please contact the Marietta Welcome Center & Visitors Bureau at (770) 429-1115. 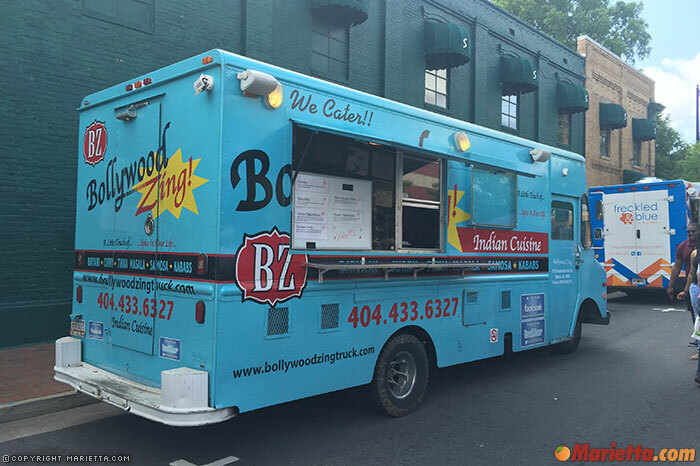 Restaurant and food vendors can call (770) 429-1115. 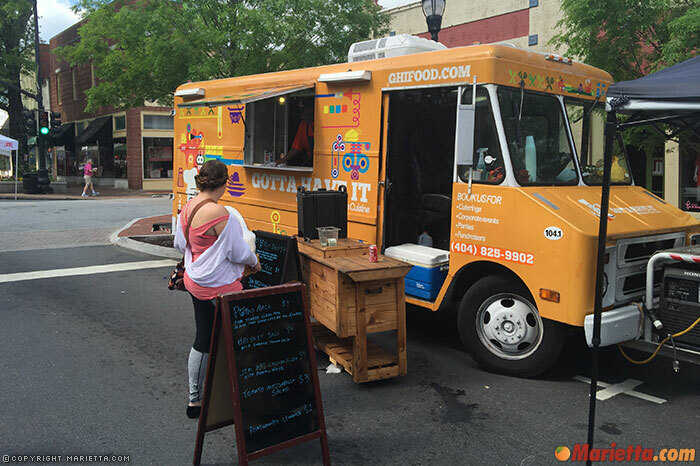 Taste of Marietta is an annual food festival that takes place on the last Sunday in April. 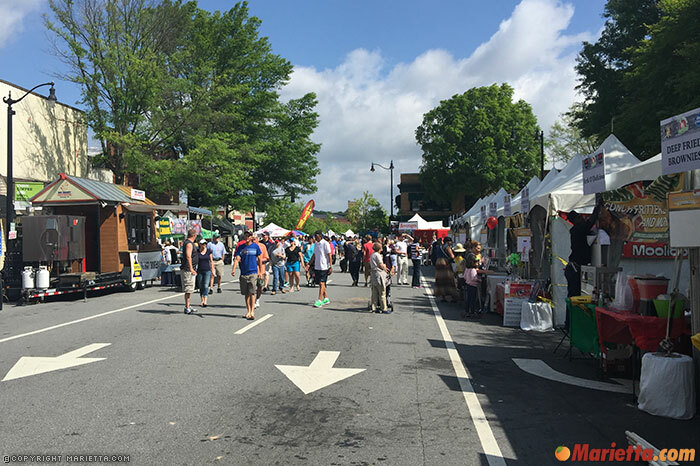 Attracting over 100,000 people each year, it is the longest running and largest food festival in Cobb County. 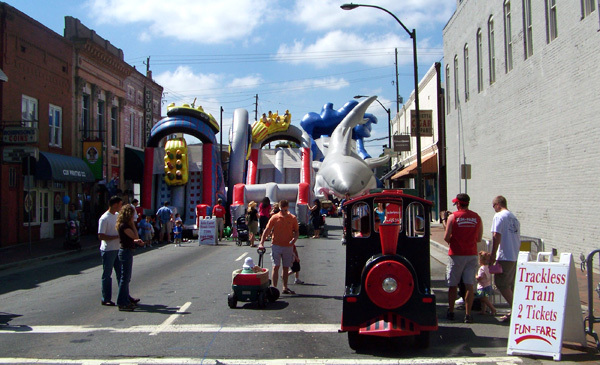 The event takes place in historic Marietta Square and also includes live entertainment, a kids alley, a sports corner, as well as close proximity to the numerous shops and museums in the surrounding square. i have been waiting on this all winter. seem as this means the beginning of a great summer. You are not the only one. We have heard from many people who are excited about this event. If anyone is reading this and wondering if they should go, the answer is yes. This is one event that you should not miss. Great event! Live music, Great Food, Family Friendly. Good stuff!!! Did I mention the FOOD!!! We had a funnel cake from Finger Lickers Concession, thats the BEST funnel I had in my life. Normally I’m a funnel cake eater and I dont know what they had special in that mix but it was the bom. Can’t wait !! Should be a great event. 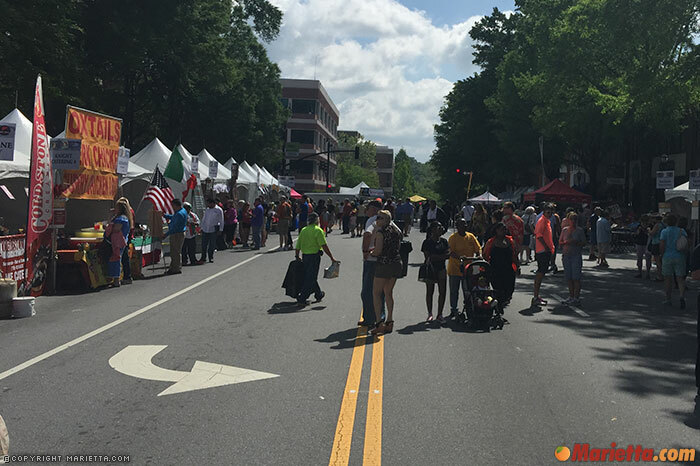 This is my 2nd time being a Cobb County resident, so I look forward to attend the Taste of Marietta this weekend! Hey I can’t wait for more deep fried brownies!!! YUM!! 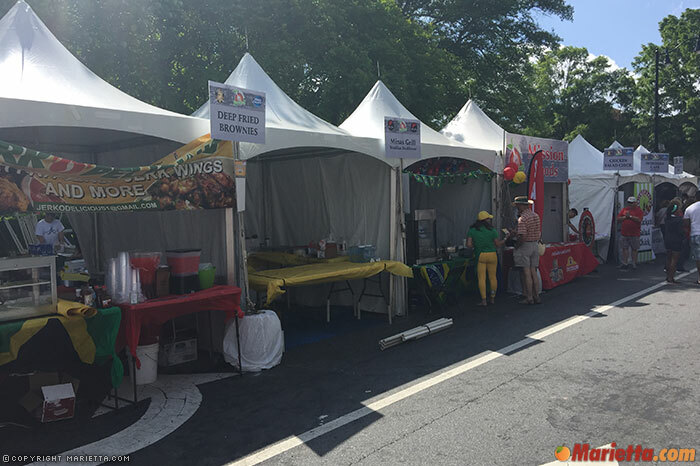 I wish they’d have a food vendor that sold hamburgers/hot dogs…maybe this year?? @LaLa…There was a hot dog vendor called, On A Roll. Several styles of hot dogs using Sabrett New York style hot dogs. They will be here for 2013! Sounds expensive. I’m use to getting tickets. Paying each vendor is going to run in the money unless they are on the low end at fifty cents. SL, stay at home please. Let the rest of us have fun without you… Please!!! 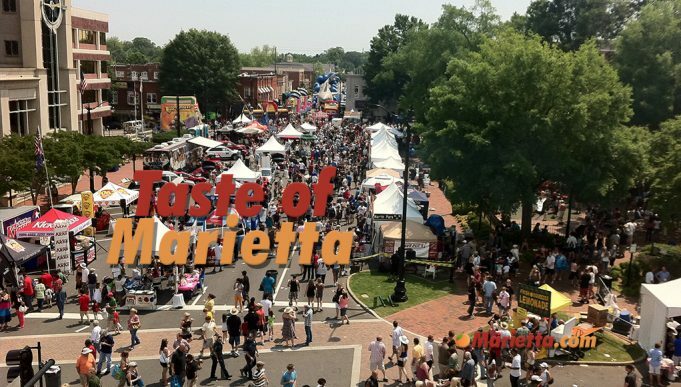 I am really looking forward to the Tast of Marietta this year. Good food, great entertainment, and lots of people to hand out with for the day. I think this year will be better than ever. i can’t wait this is event is so much fun with great food and entertainment and good people and something for the kids too come on out and enjoy !! come hungry !! 🙂 taste of marietta rocks !! hope for great weather ! Great event-we attend every year. Fantastic music and food. Would love to see you add some chairs/seating under the shade trees on the actual Square -around the Main stage so people could sit there and eat while enjoying the music. Maybe some covers over those tables on the main roads too. The festival definitely had a lot of vendors and it was neat. The place was packed with people. It was a beautiful day! My husband and I were, however, let down by the prices. I didn’t see many items in the $1 range and I didn’t see anything for 50 cents. Most of the things we would have liked to try were $4. It got very expensive fast! Brooke, go to McDONALD’S for God’s sake. It’s a fun time, affordable, and great for the community. Don’t like it? Stay home!! Frank, I was thinking the same thing, LOL!!!!!!! LOL!!!!!!!!! You’re nasty Frank, everyone has their own opinion. What do you do, hang on this site looking to tear people down for making a comment. Thanks Brooke for the info about prices.. That is important and it gives me an idea of how much money to bring, especially since this will be my first year attending. We go every year. We buy 5 differant things and we all split each plate . My son and daughter love to get differant ribs from each vendor. is still America, where the poor are just as free as the wealthy. Is it on regardless of weather? is there going to be alcohol? Yes, there will be alcohol available starting at 12:30. Shock Top and Red Hare Brewing Company are sponsors this year. Tasha – I attended TOM-2012 and plenty of dogs were there with their humans. I love the event! However, I wish that the venders had some vegan choices. I love the teenager band! They normally perform early near Eddies Trick shop! They are so talented! Yay! Can we bring a cooler with drinks? Great event! 1st time. Loved the variety. The only con was the hate-in-the-name-of-god group. Why sanction a group like that to set up at a tasting? Wine lovers, rebellious women beware?? For the love of god, seriously?!?! Just left the event…very nice time! Love that the food prices/portions were reasonable, free parking and not uncomfortably crowded. Everyone seemed to be on their best behavior and the band “Old Dudes Rock”, really did! Fun time. Will return next year if the food prices remain the same! Owners were struggling to keep control. A very large breed was walking all over everyone’s blankets and dropping his foam on those blankets as well. Also, we had dogs coming to blows as well. An accident waiting to happen. You can never predict what a dog will do when he or she comes in contact with humans who are unknown to them. Are wheelchairs available for rent? Can we bring coolers? Anyone have any good advice? I went a long time ago and the heat almost killed me. Looking forward to going and bringing a bunch of well behaved teens and their s/o…. I will be performing Live Acoustic Music at the Strand Theater from 11-7. No cover and food to be sampled on the balcony overlooking the Marietta Square. Yes, dogs are allowed. We also spotted a well behaved pig on a leash this year. Hi! Is there any way to get some volunteer hours for this event?! Didnt enjoy myself, too many rude people. I was actually cut in front of a few times. Needs police at the cross walks was given the crossing hand 5 cars went when it was our turn to cross to that Methodists church parking lot. Only good part was the dogs a lot of cute dogs walking around. Felt like children planned this event with lack of organization. We love this event every year, but…somebody didn’t check the calendar this time. Why oh why is it being held during PASSOVER??!!!? Bad, very bad idea!! Big, big problem for all the Jews of Cobb County!!! We have been for the past 3 years! Can’t wait! Always a good time. We go every year! A great day of fun, food and music!! Worst “taste of” I have ever been to. Zero people directing traffic to get to the event. Once there, it was clear that little planning was done as we had to zig zag between lines in over crowded lanes. This task proved to be very difficult to acheive as we have one child in a wheelchair and the people were very rude when we couldn’t squeeze through the five inches they would allow. Kids area was cramped, crowded, loud, and smelled of gas. Food was wasn’t that great. We tried three booths for food. Two I would never eat from again, and the third was just ok. If this is the best Marietta has it was screeming to me to run the other way by the time we got out of there. I had a great time! This is my second year attending and I’ve enjoyed both years. I tried foods that I normally wouldn’t purchase and the prices were very reasonable. Are non food vendors welcome at this event as well? I would love information on becoming a vendor if its allowed! Pet Owners: please leave pets at home. It’s difficult as is without dodging pets and their leashes! Are dogs allowed at the event, and if so, are there any rules or restrictions involving them? Love the Taste. This is my favorite one. I love that it’s not tickets. With tickets it’s hard to determine how much your spending. Samples are typically like small plates. I’ve tried a bit of everything. Bring cash. Did I mention bring cash? So, um bring cash. Wear comfy shoes that you’re not in love with because the ground gets a little sketchy later in the evenings. (Trash build up). Thing I miss the most. I used to really love that the menus and prices were available in advance. It allowed you to budget accordingly. That is one of the things that separated this Taste from all the others. Hopefully they will bring it back. Get there early. Really good and unique items will go quickly! This is a great way to expand your core restaurant base.. learn about some new ones without spending $40 each to try them.